Will OS X Lion roar in the enterprise? The App Store makes downloading and installing software for iOS devices easy—for consumers. But what about if you’re running a business and you want to get apps for all of your employees? 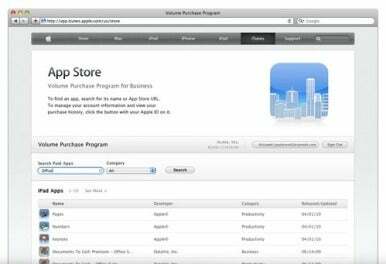 For those cases, Apple has announced the App Store Volume Purchase for Business Program, which offers to businesses the same capabilities that the company made available to educational institutions last year. In addition to purchasing apps available on the App Store, the Volume Purchase Program also lets you buy custom business-to-business (B2B) apps that third parties develop for your company. These are distinct from apps that might be developed within a company and distributed to employees, in that they are required to be paid apps (costing at least $10) and are developed out of house. The app developer, who needs to be a member of the iOS Developer program, also needs to authorize purchasers to allow them to buy the apps, at which point the process is virtually identical to buying apps in bulk from the store. Both cases allow organizations to use third-party Mobile Device Management (MDM) programs to distribute and manage redemption codes for apps. To be eligible for the Volume Purchase Program, your organization must have a Dun & Bradstreet (D-U-N-S) number, a valid business address, and business contact information. Though the program is not yet in operation, Apple says that it’s coming soon; a full guide on volume purchasing is available at Apple’s website.